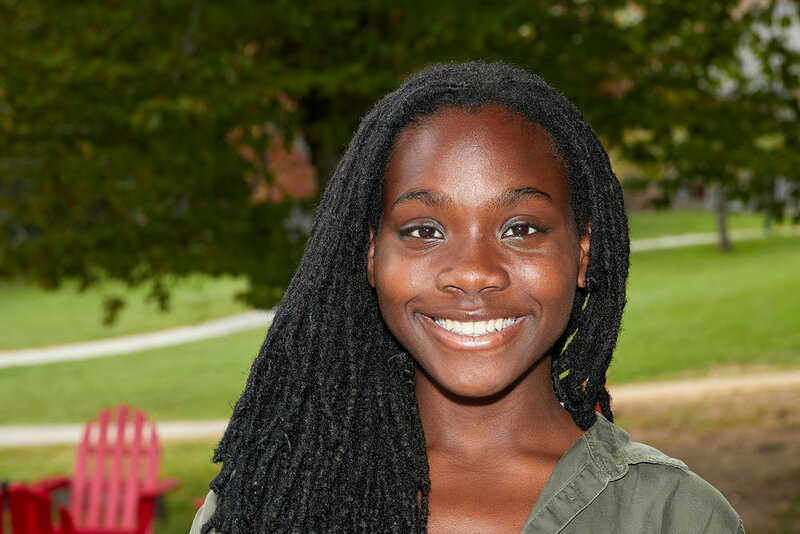 “None of my schools have ever been the same,” says Adunni Abrams ’18. Before Dublin, from elementary school through middle school, Abrams attended Poly Prep, an independent day school in Brooklyn, New York; Maple Leaf International School in Trinidad; Phyl’s Academy, a preparatory school in Brooklyn, North Star Academy, a public middle school in Brooklyn, and Trey Whitfield School, an independent school in Brooklyn. When Abrams led her Senior Presentation, which invites every senior to present for twenty-five minutes at Morning Meeting for the whole school community, she told this story. “When we were told about Senior Presentation at Dublin, we were told to find topics that are important to us and that show who we are,” says Abrams. So she told Dublin about her understanding of identity and how it has been impacted by her education. “My presentation was about learning to adjust to different cultures, being aware of your privileges, educating others about your culture, being open to new or unfamiliar cultures, and seeing the importance of being able to interact with various different people,” she describes. “I wanted Dublin students to know that it is not easy to understand other cultures. But I am glad that I went through that struggle of adjusting to new environments through my schooling because I learned so much, and I am able to interact with so many people from so many different cultures,” she says. “A lot of people don’t know how to interact with other people, and it’s not easy. It’s hard. People are looking for what’s easy, and it won’t be. But it is meaningful,” Abrams says. Abrams believes that being aware of your privileges and learning to interact with other cultures is essential to learning and living. An important component of learning to interact with different cultures is sharing yours and educating others about your culture, as Abrams says. Abrams gives the example of Trinidadian accents. And critical thinking is essential to interacting with people of diverse cultures. She continues: “Thinking about what to say and what not to say, how to think about how what you think lines up with what others might experience, recognizing that you don’t know what you think you know helps you to develop social skills, empathy toward others, a higher level of knowledge. As Abram’s senior presentation and subsequent reveal, there is much to learn when we work to understand the diverse world and worlds we meet. Building a Future: Dublin School Robotics and Scrum Inc.